Dr. Joseph (Josh) Gladden is the University of Mississippi's Vice Chancellor for Research and Sponsored Programs. He is the spokesperson for research and sponsored programs divisions which work to facilitate research and research funding as well as providing support for all funded projects at UM. The Office of Research promotes a model of service while pursuing research for the benefit of the university, state, and nation. Dr. Gladden previously served as Associate Vice Chancellor for Research and as the Director of the National Center for Physical Acoustics. As Associate Vice Chancellor, he worked with academic units and faculty to identify research trends and funding sources; worked with Federal agencies and Congressional entities to match UM research capabilities to national needs; and with the private sector on both a local and national level. 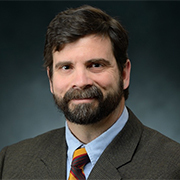 Gladden is the group Leader for the Resonant Ultrasound Spectroscopy lab, and an Associate Professor of Physics. He holds a Ph.D. degree in Physics from the Pennsylvania State University (2003) with a focus area of Experimental Condensed Matter. Dr. Gladden serves in several elected national leadership positions including a member of the Executive Committee for the National Spectrum Consortium, Chair of the Physical Acoustics Technical Committee of the Acoustical Society of America, the Group on Instrumentation and Measurement Science in the American Physical Society, and Director of the international Physical Acoustics Summer School. Dr. Gladden holds bachelor's and master's degrees in physics from the University of the South (Sewanee, TN) and the University of Montana, respectively and was a post-doctoral fellow in Mathematics at the Pennsylvania State University in 2003-2005. He and his wife Nicole have three children: Chase, Camille and Josephine.